Flex Studios is a new membership program at Artscape Youngplace that offers artists pay-as-you-go access to creative workspace in private or shared studios. Since opening in December, our team has learned a lot about how artists want to use Flex Workspace. Based on user feedback, we’ve tweaked the studio layout and booking model to accommodate the most popular requests. The Flex Studios are now divided into four kinds of space to suit a variety of creative uses. For artists looking for dynamic co-working space, we have the Flex Workspaces: twelve individual workstations in a bright and spacious open-concept studio. It’s great for artists who are sick of working at their kitchen table and want to be in a dynamic creative environment. Upgrade to Flex Workspace Premium if you need semi-private space for larger projects and collaborations. The four Premium spaces can accommodate up to three people and are bookable by the week and month. The Flex Meeting Room is a fully-enclosed private room that’s perfect for meetings of up to four people, interviews, client meetings and phone calls—it’s only $5/hour. Flex Studios Gold & Silver are two 1,000 sq.ft. 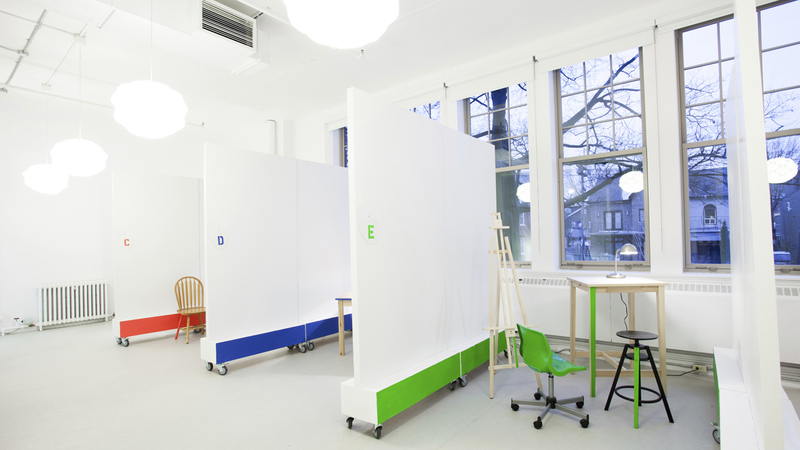 classroom studios that can be used for classes, workshops, rehearsals, performances, meetings, screenings, fundraisers, parties and more. The Studios have already hosted a number of fantastic events and initiatives! We’re also excited to introduce the new Flex50 Pass, which gives members access to 50 hours of workspace for $50, usable within any 30 day period. You can book your studio time by the hour in whatever blocks of time you need. Annual Memberships to Flex Studios cost $50/year and give you access to the lowest rates on Flex Studios & Workspace, exclusive member communications, invitations to cool member events, and discounts at local businesses. Organizational memberships are also available for artist collectives, theatre companies and not-for-profit organizations. For more info, visit the Flex Studios section of the website.